I got off to a late start today for several reasons. First, I was awakened early by what I identified as either a gunshot or an automobile backfiring right outside my window. I jumped up and peeked outside the window where I was relieved to see the back-end of a pick-up truck putting out a lot of steam, smoke, and water from the tailpipe. Somewhat reassured, I fell back to sleep. When I finally did wake up I had several hours of work that I needed to do. I am teaching two online courses this term for Gonzaga University—both of which officially started today—and there were a number of postings to be made and email correspondence to do. It was nearly 2:00 p.m. by the time I pulled out of Springfield and headed southwest. While driving through Carthage I noted a sign for the 66 Drive-In Theater and wondered whether it was still open for business. As a result of my late start it was nearly 5 p.m. as I approached Claremore, Oklahoma, home of the Will Rogers Museum. I’m going to try to visit it on my way back home. While I had hoped to make it to Oklahoma City for the night, it was getting dark by the time I reached Tulsa, and so I have stopped here for tonight. I will need to get an early start tomorrow if I am to make it to Amarillo, Texas. I was surprised to see a sign for the “Mother Jones Monument” in Mt. Olive, Illinois today. For a number of years I had subscribed to Mother Jones magazine, but it had been years since I thought of Mother Jones, who was born Mary Harris in 1837 and died in 1930. Turns out that she is buried in Mount Olive’s Union Miners Cemetery, along with many coal miners who were killed as a result of strikes against coal mine companies in the 1930’s. Mother Jones, whom one West Virginia District Attorney once called, “The most dangerous woman in America,” became well-known for advocating on behalf of the rights of coal miners and children. She also played a pivotal role in campaigning for the 8 hour day. Seeing the Mother Jones Monument reminded me of my Grandfather Lucian C. Spears (1898-1978). For most of his life, Grandpa lived and worked in Southwestern Virginia (Scott and Lee Counties). From the 1920’s until the mid-1950’s he spent his day’s underground, doing the dangerous and back-breaking work as a coal miner. In 1954 he was caught in a mine cave-in and literally had his back broken. Eventually, he was healed and was able to walk again, but he never went back into the coal mines. In his later years he suffered from Black Lung disease as a result of his many years of breathing coal dust. I was lucky to have grown up living near my Grandpa and Grandma Spears, both of whom I dearly loved. Lucian C. Spears was a tall, strong, quiet man who would do whatever he could for anyone. Years before I had ever heard the term “servant-leader,” I was blessed to grow up with such a splendid example. And while I don’t recall him ever speaking about Mother Jones, I do recall him speaking fondly of John L. Lewis, the noted head of the United Mine Workers of America who helped to secure collective bargaining rights and health and retirement benefits for coal miners and others. Grandpa was not the kind of person to talk about how difficult life had been working in the mines all those years, but it was impossible not to sense it. In 2007, I travelled back to Southwestern Virginia for some genealogical research. I drove up into the mountain to Bonny Blue, Virginia, one of the coal mines where my Grandpa had once worked. It had been closed for many years after the seams were worked out, but new coal mining extraction techniques had recently prompted it to re-open. I drove up to the gate and managed to get the guard to let me in (after signing a paper stating that I understood I was entering a dangerous work area at my own risk!). Dangerous it was, with large coal trucks and other machines rumbling in and out. I found a relatively safe place to stand out of the way, and I tried to imagine what it must have been like for my Grandparents to have lived in one of the shotgun shacks that the company rented to the miners and their families. My father had been born there in 1933. While coal mining has always been dangerous work, the lives of miner’s and their families were gradually helped by UMW leaders such as Mother Jones and John L. Lewis. I was encouraged to think that Mother Jones made a difference, and that people cared enough to remember her struggles on behalf of many of us. The outside temperature was 3 degrees as I got into my car. On my way out of Springfield, Illinois I drove to the Lincoln family mausoleum, located in Oak Ridge Cemetery, where I gave silent thanks to Abe Lincoln. Back on Route 66 I discovered that it was still snow-covered and slick in places, which prompted me to switch back-and-forth between I-55. Crossing the Mississippi river and seeing the Gateway Arch of St. Louis tickled me. I decided not to stop and see the Meramec Caverns—this despite the fact that I remember seeing signs beckoning everyone to visit for as long as I can remember. I drove along a section of the Cherokee Trail of Tears from Rolla to Springfield—the infamous forced march by U.S. troops of Cherokee families in the mid-1800’s during which many died. Trail of tears, indeed. By the time I arrived in Springfield, Missouri the temperature had raised from 3 degrees to 30 degrees. Definitely an improvement. I went out to my car this morning and the -20 degree wind chill took my breath away! I came back upstairs and decided to stay put today and to get the work done that I needed to do to finish setting up my new course in servant-leadership that I will begin teaching for Gonzaga University on Monday. This is an online course in their Doctoral Program for Leadership Studies (Servant-Leadership, DPLS 778). I also continue to teach every eight weeks another servant-leadership course in their Masters program for Organizational Leadership (Servant-Leadership, MA ORGL 530). 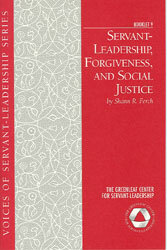 Last summer, my colleague Shann Ferch and I also co-taught an on-campus doctoral course that was based upon an earlier Servant-Leadership Writer’s Retreat that I had designed and facilitated. I find that I enjoy teaching, and especially online teaching, a great deal. The servant leader is servant first. It begins with the natural feeling that one wants to serve, to serve first. Then conscious choice brings one to aspire to lead. 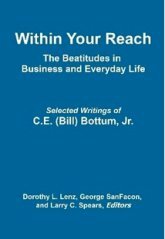 The best test and the most difficult to administer is: Do those served grow as persons? 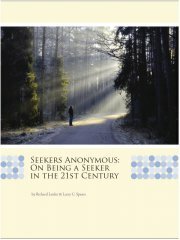 Do they, while being served, become healthier, wiser, freer, more autonomous, more likely themselves to become servants? And what is the effect on the least privileged in society; will they benefit or, at least, not be further deprived? 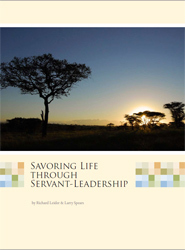 How do servant-leaders understand the meaning and applications of servant-leadership? 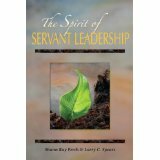 What is the meaning of servant-leadership for individuals, and for organizations with whom they come into contact? 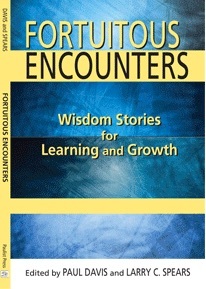 These and other questions are at the heart of student mastery for this course. Students will begin to clarify their own understanding of servant-leadership, and their own actions and practices as servant-leaders. All of this is grounded in knowledge (literature), reflection and inquiry (discussion board), and practices (papers and dialogue). 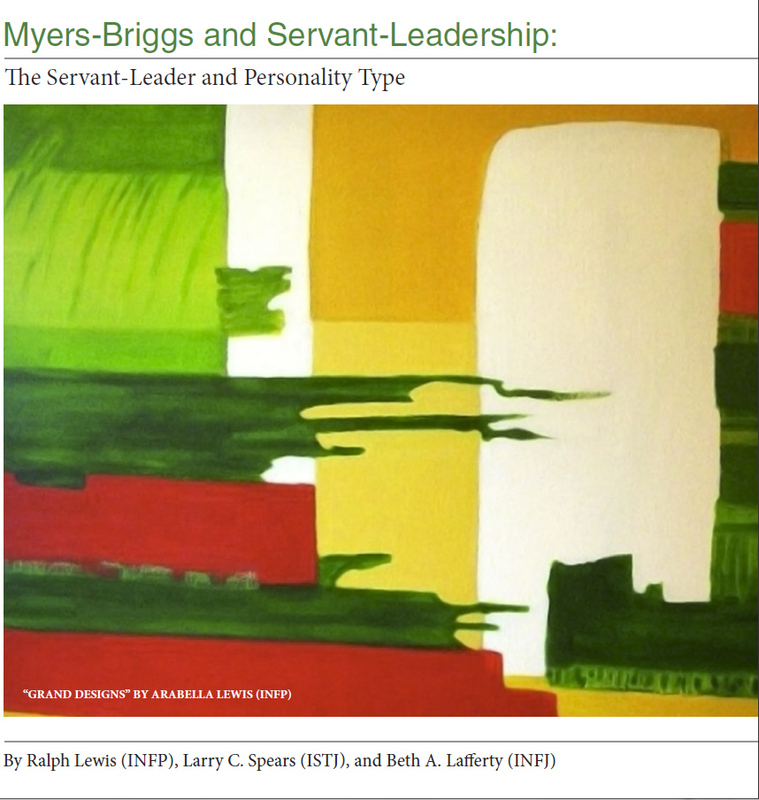 Student mastery will also involve understanding the applications of servant-leadership in organizations and in other emerging applications (Council of Equals, Myers-Briggs, Service-Learning, and Forgiveness). Students will emerge with a better understanding of themselves as servant-leaders, and better able to influence organizations through their own practices of servant-leadership. 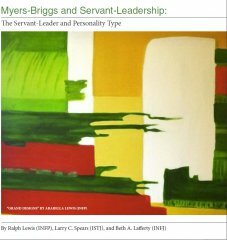 In this introductory Module we examine fundamental aspects of servant-leadership (definition, purpose, characteristics) in order to lay the foundation for our subsequent applications: personal development, organizational applications, and new-and-emerging applications. 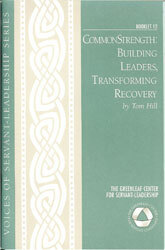 In Module Two we focus on the understanding and personal practices associated with being a servant-leader. Special emphasis is given to the cultivation of servant-leadership characteristics, and to the fundamental aspect of servant-first, then leading. 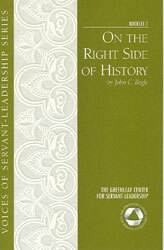 In Module Three we focus on understanding servant-leadership as it is practiced within organizations. Students will be comparing and contrasting these organizational practices of servant-leadership with an organization with which they are familiar. 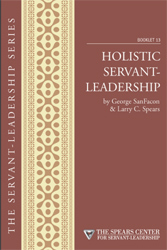 In Module Four, we will examine some of the other emerging applications of servant-leadership. 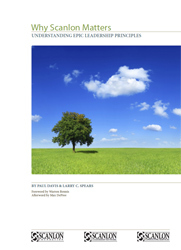 This Module is designed to demonstrate other significant implications for servant-leadership in society. Boyd, J. (2008). 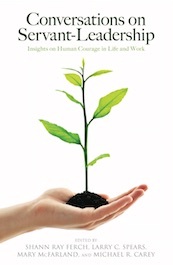 A Servant Leader’s Journey: Lessons From Life. Mahwah: Paulist Press. ISBN #0809145685. Ferch, S. and Spears, L. (2009). The International Journal of Servant-Leadership: Spokane: Gonzaga University. McGee-Cooper, A., Looper, G, and Trammell, D. Being the Change: Profiles from Our Servant Leadership Learning Community. Dallas: Ann McGee-Cooper & Associates. 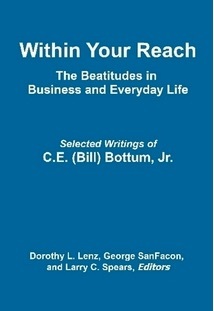 ISBN#9780979514906. Greenleaf, R. (2002). Servant leadership: A journey into the nature of legitimate power and greatness. Mahwah: Paulist Press. 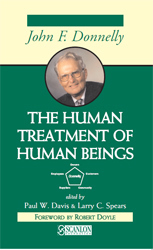 ISBN# 0809105543. My wife Beth and I celebrated our 30th wedding anniversary on January 17. It was cause for celebration and remembrances—one of which was simply that we had been married on a very cold and snowy day in Philadelphia’s City Hall in 1979. Thirty years later, we found ourselves in Springfield, Illinois on yet another cold and snowy day, as we chose to celebrate our anniversary by visiting the Abraham Lincoln Museum. Beth and I had talked about going there ever since it had opened, and we were happy to make it a centerpiece of our anniversary weekend travels. Like many Americans, we have been great admirers of President Lincoln and have read a number of books about him over the years. The Lincoln Museum, itself, was a potent reminder of the humility, sadness, and greatness that made up such a large measure of who he was. Everywhere we turned, we were reminded that Abraham Lincoln was also one of our greatest servant-leaders. It is my passionate hope that President Obama carries within him the same rare combination of “facility of expression” and “great lucidity of thought” that President Lincoln embodied. I also hope that President Obama will, through his own example, continue to inspire many more servant-leaders across our country and around the world. Well, the snow stopped and the temperature plummeted throughout the day, eventually reaching single digits and a wind chill of -15 degrees. I attempted to drive as much of Route 66 as I could today. However, the snow-and-ice covered road made driving downright hazardous, and at times I wound up driving on the mostly-cleared I-55 south, which runs parallel to Route 66 for most of this leg of the trip. In fact, at many points along the way Route 66 functions as a frontage road that runs alongside of I-55. Stopped at a Hampton Inn for the night. I am partial to Hampton Inn’s, and I prefer to stay in them when I travel, and when I can do so. A few years back, Hampton Inn sponsored an online effort to raise awareness of Route 66—something I both appreciated and admired. My original plan had been to start my trip with a visit to US Cellular in Chicago—a major company that has worked extensively with servant-leadership since 2002. However, the snowstorm resulted in their closing their offices early. While the face-to-face visit was not to be, I am happy to share with you the following short Q&A that I conducted by email with Karen Jones, a key leader in US Cellular’s Leadership and Organization Development Team. Larry Spears: What are some basic facts regarding U.S. Cellular? Karen Jones: US Cellular is a wireless telecommunications company founded in 1983. It is publicly held and has approximately 9,000 Associates [employees]. Our company mission is "To provide the highest level of customer satisfaction, which will generate profitable growth for our shareholders and superior rewards for our Associates. We will achieve this through a Dynamic Organization based on standards of excellence." The US Cellular Dynamic organization Business Model is foundationally built on the principles of Servant-Leadership. The business model depicts our core belief that [servant] leadership effectiveness leads to Associate employee satisfaction, which yields customer satisfaction, which delivers exceptional business results. LS: I had the pleasure of visiting U.S. Cellular around 2002, where I met with Gus Gustafson, Larry Fidelus, and others as the servant-leadership initiative at U.S. Cellular was being developed. Please describe the basic element of servant-leadership training at U.S. Cellular, how many people have gone through it, and any other insights you might like to share. KJ: The U.S. Cellular® Servant-Leadership Workshop was developed by the dedicated efforts of Dr. Tom Griffin, Dr. James (Gus) Gustafson, and Dr. Larry Fidelus. Additional consultation was also received from the Greenleaf Center and Wilson Learning Corporation. The U.S. Cellular® Servant Leadership Workshop's initial pilot was launched in 2002. The class was subsequently evolved and a second pilot was launched in 2004. Our Servant Leadership Workshop reflects a robust environment of learning. We take Associates to a peaceful, off-site retreat-like atmosphere. We place each participant into a small “cohort group” for the most reflective exercises to create a safe environment for introspection and transparency. The final souvenir for a U.S. Cellular® Associate, having experienced the Servant-Leadership Workshop, is their personal “Legacy Tree” and a copy of their personally authored “Retirement Speech”. The Legacy Tree is a visual personification of one’s aspiration for being a Servant-Leader at U.S. Cellular®. Associate’s proudly display their Legacy Tree within their work environment or office. Construction of one’s “Retirement Speech” is a future-forward introspective exercise that challenges the participant to create the life legacy they wish to have at the “end of the road”. Leaders are required to share their retirement speech with the members of the team they lead upon return from the Servant-Leadership Workshop experience. LS: Tell us a bit about yourself; how you came to U.S. Cellular; your role there, etc. KJ: My journey to U.S. Cellular® was literally driven by a desire to experience Servant-Leadership first hand. 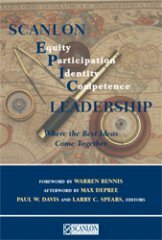 I am an 18 year Organization Development practitioner, and have worked for other Fortune 500 companies, yet never experienced the authentic leadership principles I had taught on behalf of the executives I served and supported. I had heard of Dr. Tom Griffin, and the excellent work in progress at U.S. Cellular®. Though gainfully employed at another Fortune 500 company, I made hopeful efforts and was accepted into their regionally renowned Leadership and Organization Development Team. I now consult with leaders of various organizational levels to deliver a stellar set of leadership development experiences, and to help them design successful business strategies through the lens of our Dynamic Organization Business Model. LS: You and I first became acquainted last year when you were a student in one of the online graduate courses in Servant-Leadership that I teach for Gonzaga University. I know that servant-leadership means a lot to you. If you would, please share some of your thoughts regarding servant-leadership and its impact at U.S. Cellular. KJ: My experience of Servant-Leadership at U.S. Cellular® is career unprecedented. I have been with the company for 2 ½ years and have, for the first time, experienced the leadership authenticity I was looking for. No longer are my leadership lessons incongruent with the actions of the executives I serve and support. Servant-Leadership is REAL and thrives here at U.S. Cellular®.